A 1994 dealer advertisement for Big John from Parker Brothers. 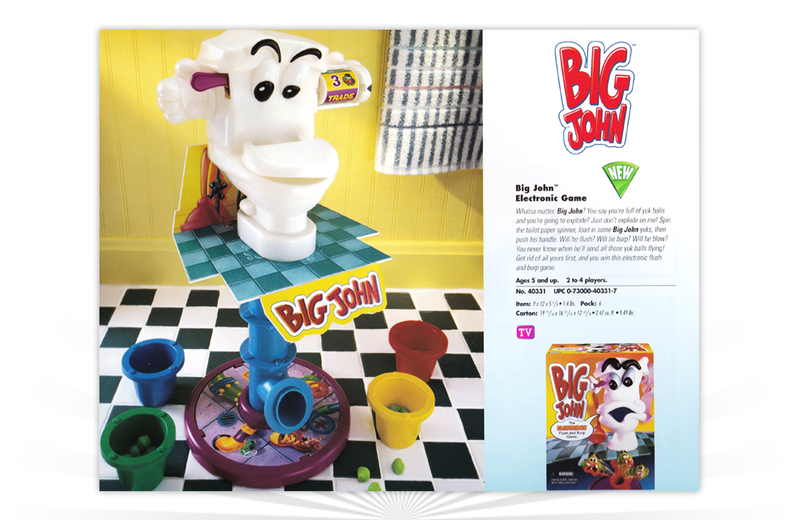 Advertised as “the electronic flush and burp game,” the board game put a whole new spin on toilet humour. Two to four players could take turns spinning the toilet paper spinner to determine the number of “Scuzzies” they would put in the toilet bowl. After loading up the bowl, the player would push down on the handle the same number of times. If Big John flushed, the player collected all the scuzzies. If Big John spit out, the player would have to put the scuzzies back in their scuzz bucket. The first player to eliminate all their scuzzies was declared the winner. Big John’s flush or no-flush capability was powered by three AAA-size batteries. Remember the toys and games of years past through vintage advertising – for better and for worse! An advertisement from 1984 for Western Gun Sets from Ideal. Christmas is just around the corner and the more toys the merrier according to this 1967 advertisement from Fisher-Price.